The Bajra Khichdi from Haryana is traditionally rustic and simple – no frills – no onion, garlic, potato, tomatoes etc. No spices, just some cumin seeds, ginger, hing and turmeric powders. The ghee used to make the ‘tadka’ (and the garnish, if you opt for it) gives just that touch which takes the dish from tasty to uber delicious. I used freshly homemade ghee (ahem!) and the aroma just filled the house. A few days ago I had re-posted my recipe for Panakam (the delicious jaggery and dry ginger drink for hot humid days) on my social media pages. Among the many ‘likes’ and responses to the recipe for this cooling drink, I was surprised to see how many of my readers asked about the recipe for Neer Mor. Surprised, because Neer Mor is so easy to make that it doesn’t really need a recipe. I then realised that just because something is simple doesn’t mean one automatically knows what goes into it and in what proportions. The challenge in cooking for the New Mom (specially the Indian Mom with a taste for spices and chillies) is making food that is not only appropriately healthy and nutritious, helps in lactation and /or in healing the exhausted body, but is delicious and tempts the appetite too. Its surprising however how much flavour a little ghee and fresh ground pepper can add to even unlikely vegetables such as the various gourds, never a favourite in my family in the best of times. The first 40 days following delivery being critical to the wellbeing of the new mom, the food has to be appetising and well balanced to give the overall health benefits and to lead the body back to good health. This is the first of the set of easy recipes I am writing from the food I actually make for my daughter now that she has delivered her second baby, a few days ago. I will be making Khichidi for the New mom, most days for dinner, using of course different vegetables and some changes in flavours to keep it interesting at each meal. My post on cooking for the new mom, elsewhere on this blog, gives an outline of the diet and a broad list of what foods are good or not to be served post delivery. These are of course, from my experience and based on traditions that I have learnt from my Tamil Brahmin background, interspersed with North Indian food and with Western food to suit the tastes of my daughters. The recipes are largely Indian, but you will shortly find recipes for hummus of chickpeas, and home made pita bread on the menu for one of these 40 days post delivery. 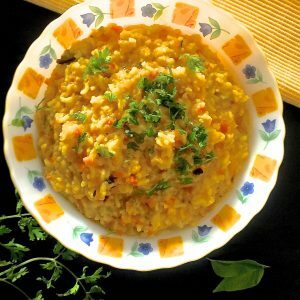 This recipe of Khichidi for the New mom is however very Indian and traditional. It is nutritious and if made without adding chillies or spices, is just right for her. The addition of garlic, mustard and cumin seeds, pepper and plenty of ghee (clarified butter) to well cooked rice and easily digestible moong dhal lentils makes for a balanced meal or pathiya samayal as it is called in Tamil. As I have been making khichidi for my daughter almost every evening for dinner, I have been adding different suitable vegetables each evening. Carrots (peeled and diced small), methi (fenugreek leaves)- washed, drained and minced, spinach leaves, or a plain gourd such as snake gourd or chow chow (marrow gourd) would be best. I have added a little tomato occasionally, after the 4th day from delivery. The important thing in this recipe is to add plenty of water so that the khichidi is quite fluid, be liberal with the ghee and flavour with powdered pepper and cumin. Serve with roasted or microwaved pappad. This Recipe for making Pudina Rice or Mint Rice, is dedicated to H.U.G – Humane Universal Good Deed Network, who had undertaken to generate and distribute 200,000 meals for the needy and the underprivileged at Bangalore, during the Daan Utsav between 2nd and 8th October 2016. A menu had been planned with simple rice items which could be easily cooked even in large quantities, in the micro kitchens established by H.U.G, and by volunteers who came forward to help in this endeavour. Follow H.U.G and the hashtag #HUGFeedWithLove, on Facebook to know more about the event. One of the items on the menu was a Pudina Rice, and here is my recipe for preparation of the same. There are two ways of making Pudina rice. One way is to make a paste of the mint along with the other ingredients, sauté the mint paste to a thick sauce, add the rice to the sauce and cook. The other method is to cook the rice separately, and then mix in the sautéed mint sauce. My daughter Mridula suggested that I follow the second method, as it is easier to manage the proportion of rice to mint mixture, and also as it helps retain the lovely green colour of the mint. I’m glad I followed her advice, the pudina rice looked gorgeous and tasted delicious. In both methods, you need to grind/ blend the ingredients into a smooth chutney or pesto like consistency. I have a little potted plant of mint which is the sole occupant of my herb ‘garden’. It’s been sitting in my balcony for the last 8-10 months, and I haven’t done anything to help it grow, except water it faithfully. This plant has decided it wants to be a bush, and it has been overflowing its large pot. The leaves have a stronger minty aroma than the pudina I get from the market, and the leaves are smaller than the regular ones too. I was glad to be able to pluck a cupful of leaves for making the pudina rice, but it doesn’t seem to have a made the smallest dent in the abundance that remain. In all honesty, I have never liked pudina rice. I had tasted it somewhere a long time ago, and perhaps it was not properly prepared, as the taste was slightly bitter and raw. It was enough to put me off this green rice for all the years since I first tasted it. The pudina rice I prepared yesterday was totally different, and I feel sorry I had missed out on such a tasty dish, which is so easy to prepare too! With my flourishing mint plant offering me fresh leaves whenever I need them, I’m sure I will be making the rice frequently. I made the rice with Basmati rice, a fragrant one that I had bought in Punjab when I last visited. I followed the guidelines given in the blog Spice up the Curry, to some extent, and the rice was cooked perfectly, with the grains remaining separate without getting mushy. I cooked it in a covered vessel rather than pressure cooking it. i. Regular raw rice may be used to make the pudina rice, instead of Basmati, in which case the rice may be pressure cooked as in the instructions below. ii. Peanuts may be substituted for the cashew nuts in this recipe, to add a little protein and to make it more practical for bulk cooking and distribution. iii. Vegetables such as potatoes or peas may be added to the rice. I put in capsicum slices to give some texture and for its fresh taste. If using potatoes, boil and peel, cube and add to the mint paste when you are sautéing it. The garnish of browned onions is another idea from the blog Spice the Curry. I had been caramelising onions for another recipe, so all I had to do was take some of the onions and add them to the pudina rice before it was served. It added just the right touch of flavour and texture. I’m going to keep some browned onions in reserve, it gives such a delightful finish to most savoury dishes. This is one of my favourite one-pot, easy to make, comfort foods. The humble Khichidi, the popular Indian dish, is, as we all know, made of rice and split green gram lentils, seasoned and spiced according to the local culinary practices and then cooked into a soft fluid mash and finally garnished, usually with fried cashew nuts and with fresh cilantro leaves. There are as many, or maybe more, varieties of khichidi as there are regions in India. In some parts of the country, a thicker drier version is made, as compared to the moist flowing version I have described here. 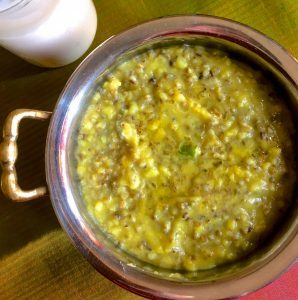 Not all khichidi is made with Moong dhal, some use other ingredients such as the Sabudhana Khichidi. Savoury Palak or spinach can jazz up your everyday lentils for a tasty and nutritious dish. Dhal Palak is usually made with Moong dhal, but try this recipe with Arhar or pigeon pea lentils, for a robust and flavoursome side dish.